Full view of a dart board in the Steinway Beer Garden, in a pre-release GTA IV screenshot. Aiming during a game of darts in GTA IV. 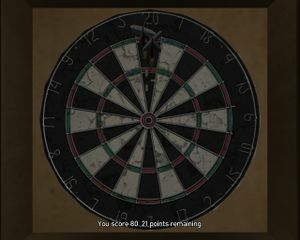 Darts is an activity that can be played in Grand Theft Auto IV, and its episodes at the Steinway Beer Garden in Dukes or at Lucky Winkles in Algonquin. It can be played in Grand Theft Auto V at the Yellow Jack Inn in Blaine County. In GTA IV these places serve as both drinking and darts venues. This venue is available on dates, and while socializing with friends. To win, the player must be the first to reach 0 points, as described below, from an original score of 301. The highest amount you can score in a round is 180. Score points by throwing darts within the 20 numbered sections [numbered 1 to 20]. Hitting one of the large portions of a [black or white] section scores you single points. Hitting within the outer [red and green] band scores you double points for that dart. The middle band [the inner red and green band] scores you triple points. The bullseye is the circle in the center of the board. The outer ring scores 25, the inner circle (the bull) scores 50. The object of the game is to reduce your score to exactly zero, before your opponent does. During aiming, the player's crosshair will tremble violently, making aiming slightly difficult. By pressing a specific command, the player can momentarily improve accuracy for a second, indicated by a steadier and more focused crosshair. When playing darts, a general rule of thumb is to initially aim for a large reduction of the player's score during the first run, focusing on reducing the score by a maximum of 180 by aiming for the inner band of the "20" section, giving the player a 60 point reduction for each shot. If the player has a score low enough to be canceled out with less than three darts but is odd, the player must attain an odd score from one dart shot, then aim for a double, as double scores are invariably even. Put it simply, basic math must also be applied when playing the game. It is possible to win a game in six darts or two turns at the board. On the first turn, score three triple twenties (180) reducing the score to 121. On the second turn, hit a triple twenty with the first dart (60), an eleven with the second, and finally finish with a bull (50). Note, the first two darts can be thrown in any order but the third must be a bull. An alternate way to win in 6 moves is to hit 3 triple 20s (60 each, 180 total), then on your next turn, hit another triple 20 for 60 points, then a triple 7 (21), and then a double 20 (40). Much simpler than having to hit a bullseye. 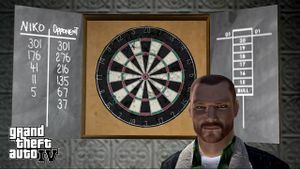 Scoring a 180 with three darts is a requisite for the "One Hundred And Eighty" achievement for GTA IV. Niko Bellic: Colors of the flag of Serbia. Roman Bellic: Game art of the unnamed bikini-clad woman from Grand Theft Auto: Vice City, reflecting his love for women. Little Jacob: A marijuana leaf, reflecting his casual use of marijuana. Patrick McReary: A caricature of a drunk, pants-less Irish man (similar to that of the Lucky Winkles' logo). Unnamed opponent (if the player doesn't play with a friend): The flag of Scotland, likely referencing Rockstar North. This page was last modified on 16 April 2014, at 19:20.